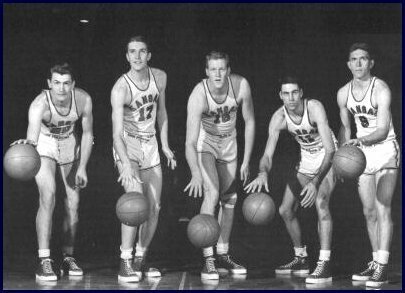 The 1952 NCAA Men's Division I Basketball Tournament involved 16 schools playing in single-elimination play to determine the national champion of men's NCAA Division I college basketball. It began on March 21, 1952, and ended with the championship game on March 26 in Seattle, Washington. A total of 20 games were played, including a third place game in each region and a national third place game. Kansas, coached by Phog Allen, won the national title with a 80-63 victory in the final game over St. John's, coached by Frank McGuire. Clyde Lovellette of Kansas was named the tournament's Most Outstanding Player. This tournament was the first to have a true "Final Four" format, with the winners at four regional sites advancing to the final site—although the four regionals did not receive distinct names until the 1956 tournament. It was also the first to have regional television coverage. St. John's advanced to the first full-fledged Final Four in Seattle, March 25–26. From 1946–51, four teams had gone to the site of the championship, but only the two regional champions contended for the title. The two regional runners-up played for third place. Now the tournament had four regionals (two in the East and two in the West) and four contenders: the Redmen, Illinois, Kansas and Santa Clara. Kansas, led by 6-9 All-America center Clyde Lovellette, easily won the playoff, beating Santa Clara by 19 and then St. John's by 17. It would be KU coach Phog Allen's only NCAA crown.